Day 13: Shout Of Relief! Last night, I got up at one point to use the bathroom and saw the stars. The moon is real thin right now, so the stars were quite stellar! I could see the silhouette of all the mountains lit up by the snow on them and the sky was sparkling with stars (and the Milky Way I’m guessing). Really cool. It was a brisk morning today that started with an immediate climb straight up to Bighorn Pass. Rockin & Why Not on the climb up to Bighorn Pass. 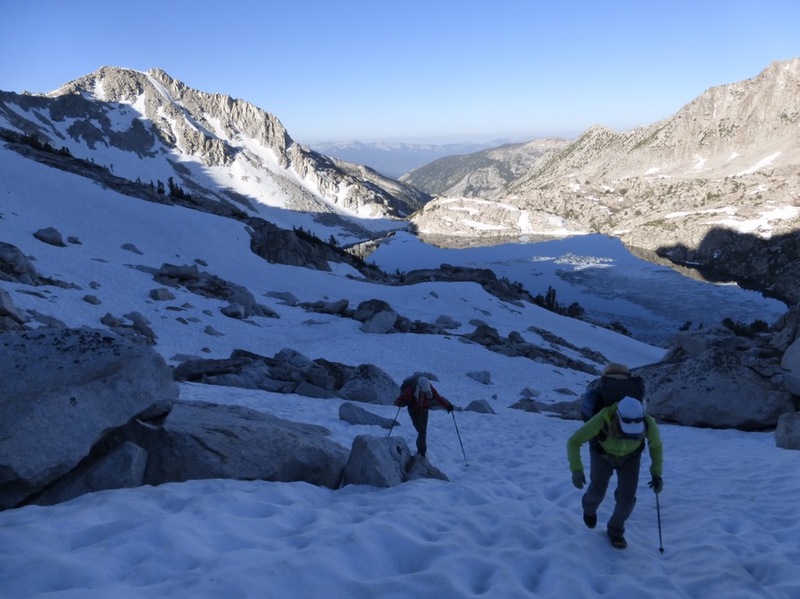 It is quite the difference how climbs like this are becoming second nature with a pack on. I guess just doing it repeatedly is getting me more accustomed to it. Notice, I didn’t say that I enjoyed it, just that I’m getting use to it and it doesn’t scare me as much as it did the first few times. 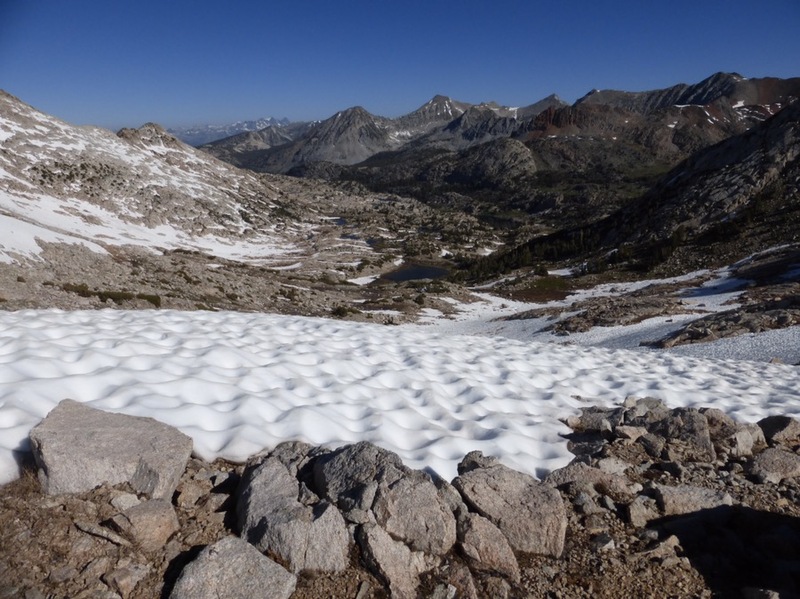 Once we got up to Bighorn Pass, we had Shout-Of-Relief Pass immediately after. Normally, this would be a straightforward contour around to the the right and around a bend to Shout-Of-Relief. Of course we had frozen over, early morning snow to contend with. What should have taken an hour took at least double that to negotiate the steep icy snow slopes. The snow did not work in our favor here. Looking north from Bighorn Pass. This snow was unique from the past snow we’ve been on. The sun hadn’t hit it and our microspikes magically clung to it like a cat on a tree. We found ourselves traversing and climbing angles we never would normally. I just didn’t look down and tried not to think about what would happen if I slipped. We also had to hike on snow between huge boulders and just hope it was thick enough to hold. Looking over to the north side of Shout-Of-Relief Pass was like a big sigh of relief. We are pretty much home free (as far as sketchy pass stuff) for the rest of this leg and it was nice to have the most stressful parts over with. View north of Shout-Of-Relief Pass. After coming over the pass, navigation was less obvious as we had many lakes to walk along, but they were kinda obscured by long smooth rock shelves we were walking on. Again, I am impressed with the patience and willingness of Why Not and Rockin’ to go with trial and error instead of using the GPS. 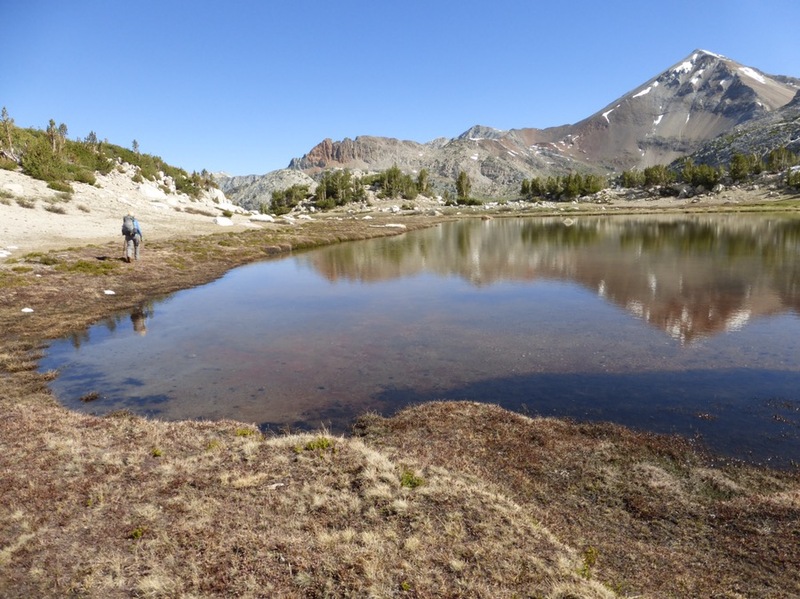 It got to a point where some things were starting to look similar and it was difficult to decide which of the tons of little lakes and tarns we were at with it being such a high snowmelt and runoff this year. We probably could have spend more time trying different things, but thankfully we used the GPS and found that we were just about 30yds past the specific spot where we were looking to be. So close! One of many small lakes we hiked past. The next task was a quite steep descent with the general direction being to stay well west of the creek as you hike down the canyon. 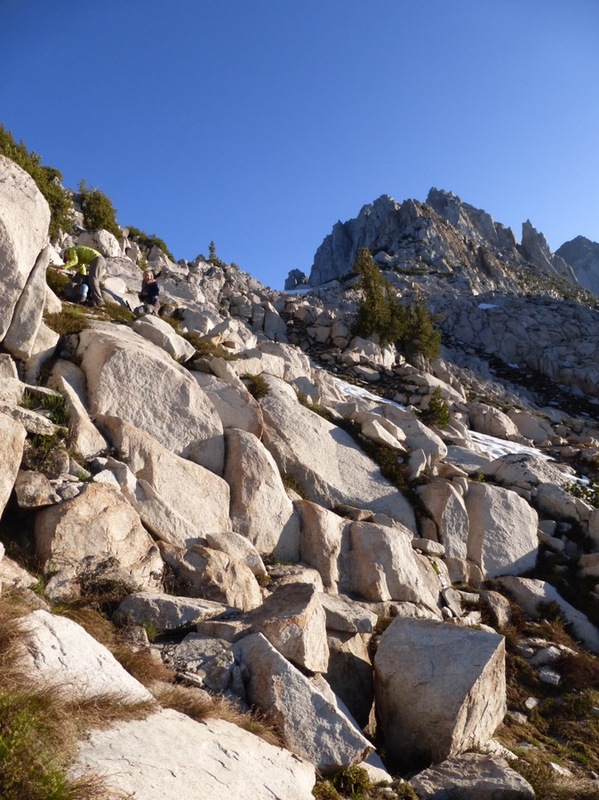 Half of the descent was on granite slabs. Those are nice and easy to walk on, but when they are steeply angled, walking on something that smooth is disconcerting. With relief that the descent was over, we made it down to a meadow area called Horse Heaven. We needed lunch before we had a big climb back up and accepted a less than ideal spot at the end of the meadow along Fish Creek with plenty of old horse droppings around and even more mosquitoes. Still, not terrible and amazing that this is the first lunch we even had to think about mosquitoes. 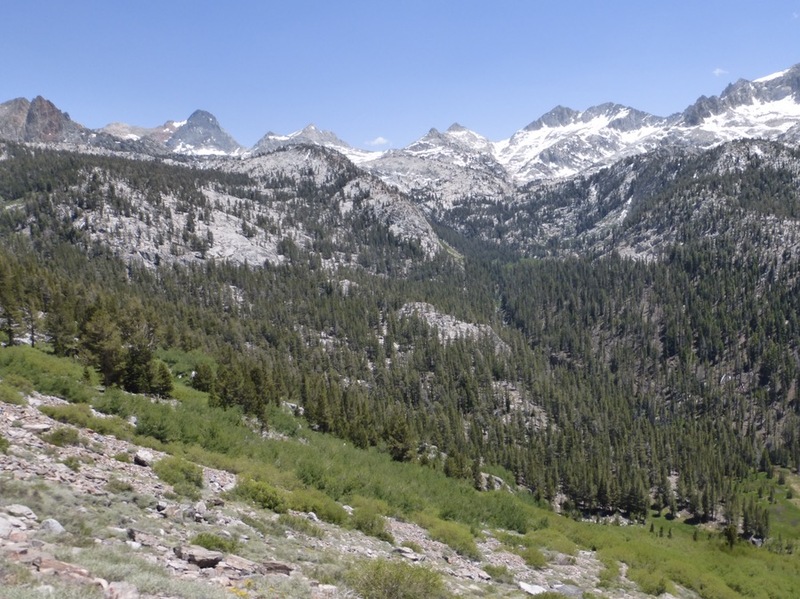 Soon after lunch, we got to overlap with the JMT/PCT again for 6mi. 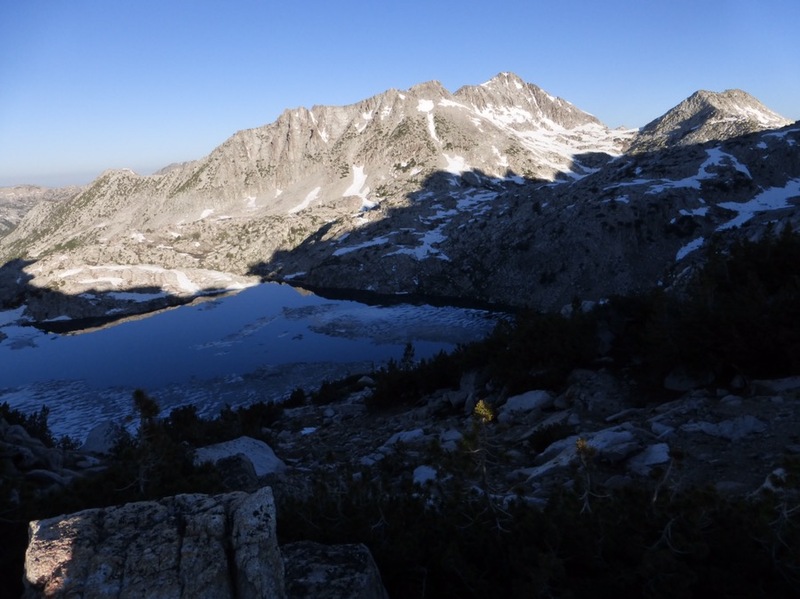 It was the section from Horse Heaven to Duck Lake, with a lot of elevation change, and Lake Virginia and Purple Lake. 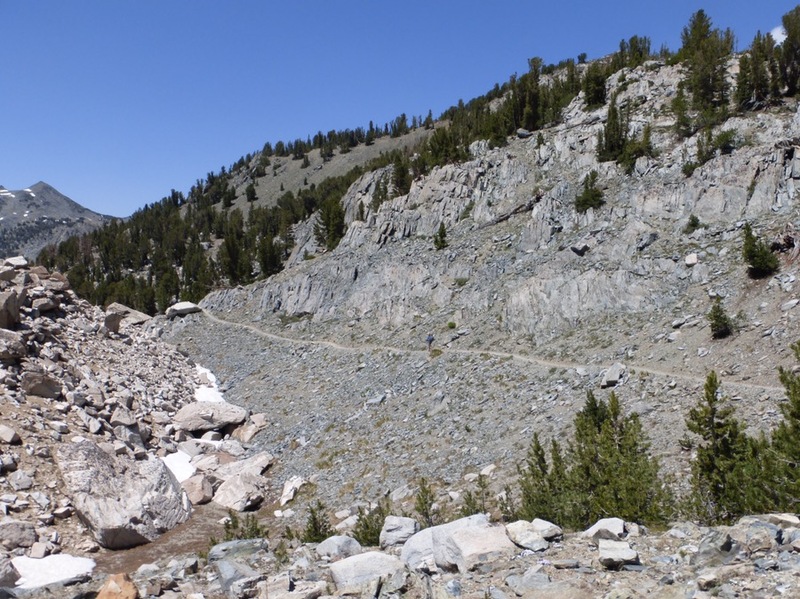 Long and exposed JMT/PCT switchbacks going up to Lake Virginia. From the top of the switchbacks, we could look back and see Shout-Of-Relief Pass and the whole canyon we came down on the faint trail. That one was really cool to see from a distance. Shout-of-relief pass is in the center where the little cloud is. 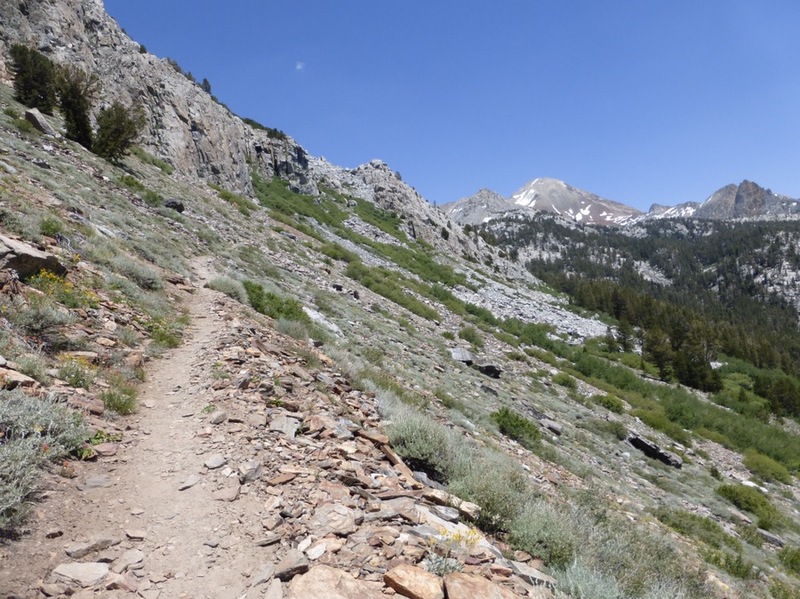 Once on the JMT/PCT, we had about 6mi to stretch our legs. We agreed to each do our own thing and meet up at the end of the 6mi. Again, it was great to listen to my headphones and just go. Both myself and Rockin’ were the same pace and we stuck together. She was kind enough to stop and get this photo of me at Lake Virginia for my friend Virginia who I saw in Big Sur just before this trip. This one is for you Virginia! 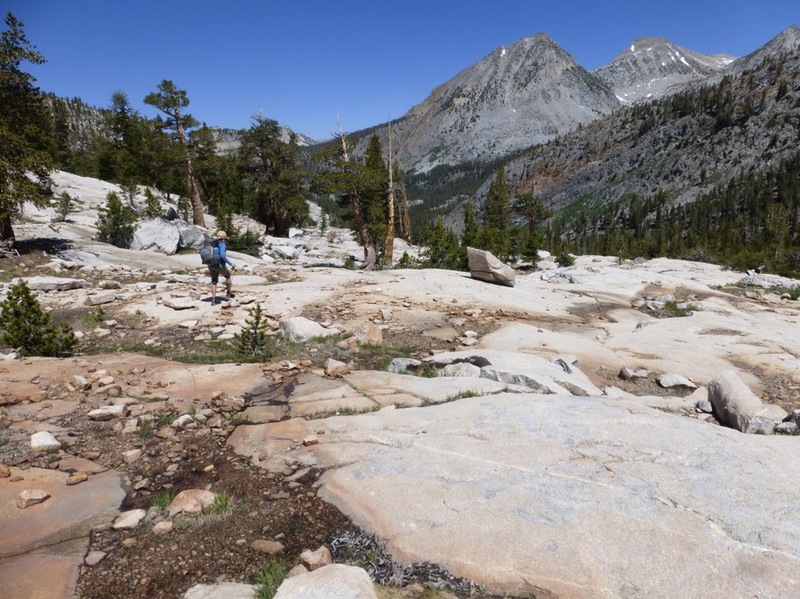 While overlapping with the JMT/PCT, I counted over 40 hikers that we saw in those 6mi. About 7 of them were PCTers(this seems to be the back end and there are more JMTers). One of them knew myself and Rockin’ from our blogs, which was cool. Rockin’ cruising down the trail. We got to our intersection and waited for Why Not who was not long after at all. While there, it was fun to see people walk by and how many accidentally turn off the JMT there and head the wrong way. 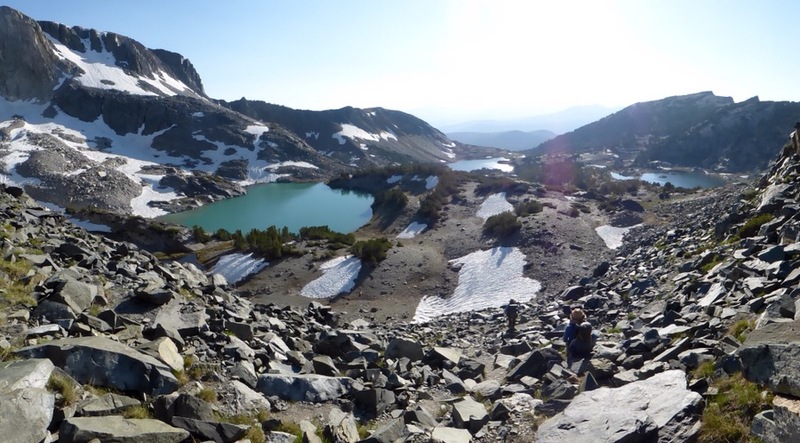 Where we turned off the JMT/PCT, the trail headed toward Duck Lake and Duck Pass. The guidebook says Duck Lake is the largest lake on the SHR. We thought Lake Italy seemed larger, but it’s definitely huge. Great emerald color too. Duck Lake with Duck Pass on the far left. Once over the pass, we knew we’d all get phone service for the first time in 6 days. The phones went on and the notifications flew in. It was addictive, but it was the end of the day and we still had some cross country miles to do. I get cranky at the end of the day and I knew we were ending a bit later than usual, so shockingly, it was me that pushed for us to turn them off and move on from our glorious signal. Yes, we all were shocked it was me to say it, but I knew it was getting too late to have a non-cranky Wired at the end of the day. 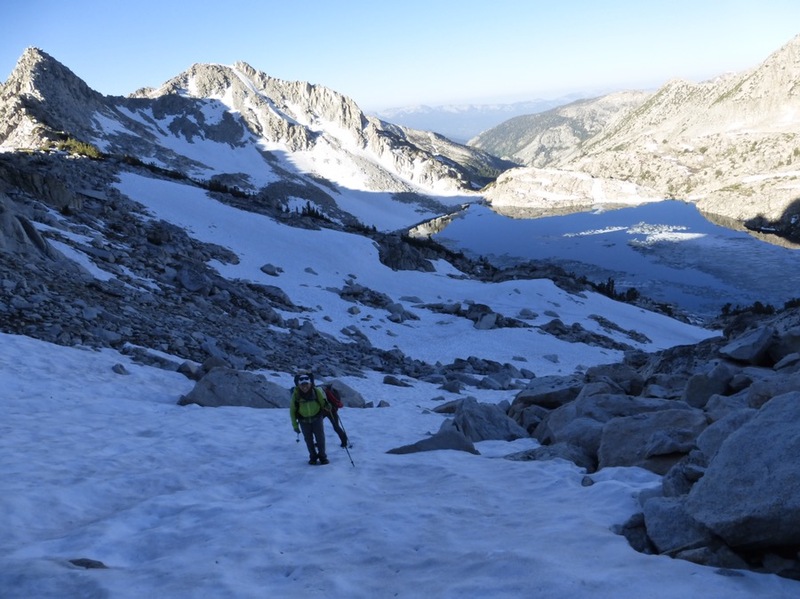 We headed cross country along the Sierra Crest. We think there was a faint use trail that would have worked, but mistakenly didn’t take it. There was a minor saddle to go over and then we could see our final destination, Deer Lakes. We are camped on the far end of the lake on the right. Given that it’s 4th of July weekend and that this area isn’t too far from a trailhead, we expected tons of people, but just a few were there and we were able to find a spot. A nice day with quite a lot of variety. This was a full spectrum day on the SHR for sure! Campsite at Deer Lakes. We came over that middle dip in the background. 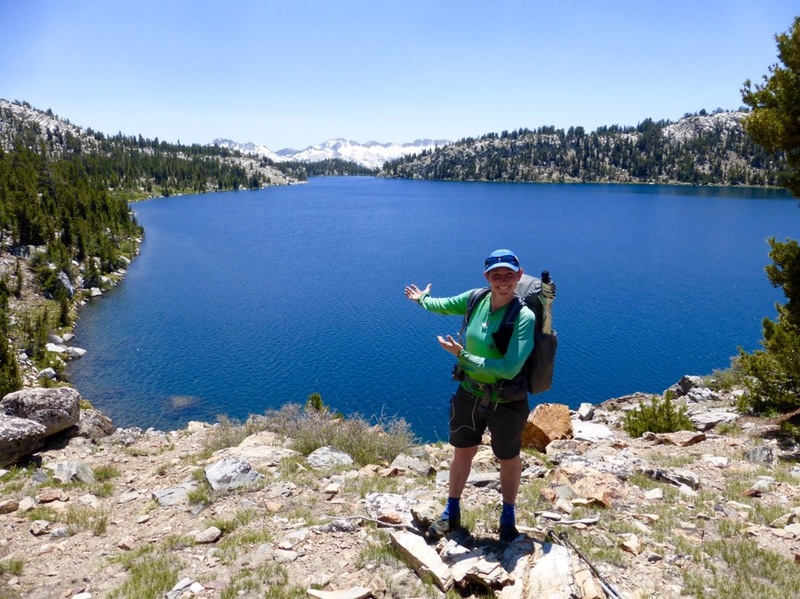 Love all the beautiful lakes and the different terrain on this hike compared to your others. Look forward to your posts. It’s for sure something new and that’s why I was drawn to it. I thing the Winds at the end of July will be pretty great! Love the lakes. So pretty. I thought the Shout of Relief title was a joke. Wonder how it got it’s name?? I love lakes too! Just not the mosquitos that tend to hang around them. Beautiful terrain. Enjoy.